The growing season can be short in Canada, so get started on your flower garden early, with these tips. Your garden can be a thing of beauty — and by the time winter comes to an end, you’re ready to get outside and start working on your own backyard oasis. Get a jump start with these easy ideas. Once the snow has melted, the first step in preparing for the Canadian growing season is to do a spring clean up. Take control of your garden early by clearing out all the dead annuals that have remained all winter. This will make room in your garden for new plantings, and the dead foliage will be valuable addition to your compost. When you see new growth forming, trim up your perennials. Cut down ornamental grasses. Take action against weeds by clearing out any young seedlings that are just beginning to sprout. Weeds will generally grow faster than your perennials, so take this opportunity to nip them in the bud. Clear away any garbage and non-organic waste that has accumulated over winter. After doing a thorough spring clean up, take stock of your garden and prepare for new planting. Trim back your grass if it’s encroaching on your garden. Loosen up the soil around your plants and mix in your compost to add nutrients to the soil. Add a layer of mulch to prevent weed growth. Consider dividing your perennials if they don’t flower well anymore. Gently rake and add compost to any bare areas that you would like to add annuals or perennials to. Cover with a handful of mulch. Many perennial spring-blooming flowers have to be planted in the fall. Bulbs need to get their root systems established before the ground is frozen. Tulips, daffodils and hyacinths are just a few examples of bulbs that are planted in August to October (depending on your location) to ensure a beautiful garden of flowers early in the spring season. Garden centres and nurseries plan ahead for the spring/summer planting frenzy and begin to offer annual bedding-out plants that are ready to add to your garden in early spring. 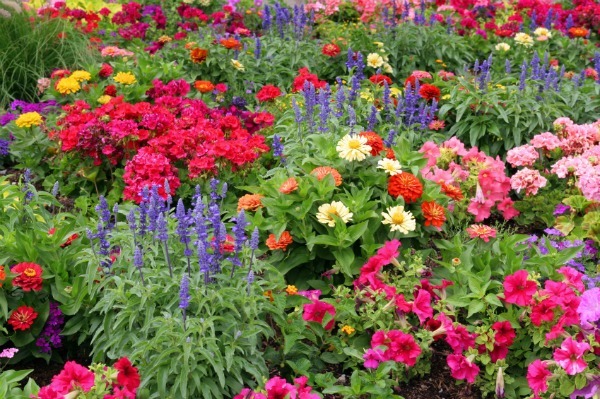 Annuals can provide a burst of colour and life to your garden while you are waiting for your perennials to bloom. As there are so many different varieties and colours available, it’s almost certain you can add a nice accent to your existing garden space. If you can’t find the flowers you desire or would like to look into a more cost-effective option, starting your own annual seedlings is a fulfilling way to go. Most garden centres also offer perennial favourites, such as roses and shasta daisies, that are grown and ready to transplant into your own garden to offer enjoyment them year after year.